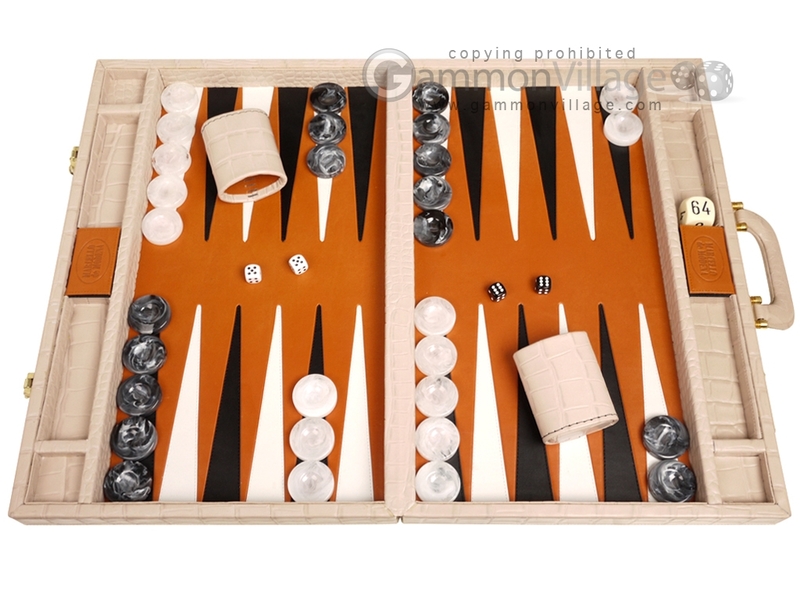 Here's a backgammon set that is a must have! Designed in Italy, the Marcello de Modena backgammon set is made specifically for tournament players. It features great styling, quality craftsmanship, and serious durability in one great package. This all-leather backgammon set features one of the greatest playing surfaces in the industry. The leather inlays are perfectly assembled, resulting in a smooth and fast playing surface that is built for speed. The large checkers, perfectly weighted, glide effortlessly into position and form the perfect prime when closing out your opponent. Featuring a rigid wood frame and reinforced construction, this backgammon board can handle the toughest backgammon players and is designed specifically for the rigors of the backgammon tournament circuit. Sometimes, we need our backgammon sets to be just as tough as we are! Each Marcello de Modena backgammon set comes equipped with official tournament-sanctioned 30mm doubling cube and matching leather dice cups. The case features elegant combination locks, as well as 2 discreet storage compartments on either side (beneath logo flaps), perfect for storing dice. Click the specifications tab (above) for a detailed description of this backgammon set, including all materials and sizes. You may click any photo above for a closer view. Closed Length: 21" Width: 14 1/4" Height: 3 1/2"
Open Length: 21" Width: 28 1/2" Height: 1 3/4"
Cup Height: 3 3/4" Width: 3"
Page P5397 Copyright © 1999-2019 GammonVillage Inc., USA. All rights reserved.